Ella’s Bubbles is the expert when it comes to walk in bathtubs. We make sure our customers get the perfect walk in tub, but with so many options it can get overwhelming. We want to make sure our customers are well informed about our walk in bathtubs to make it easier to find the perfect match. Along with our excellent customer service to answer your questions, we offer all the information you need in one easy to find place. Continue reading and you will find the ultimate guide to Walk In Bathtubs. Inward swing refers to the door of the walk-in tub that swings inward towards the inside of the tub. This takes up the least amount of space and is the most common door option. Outward swing refers to the door of the walk-in tub that swings outward toward the outside of the tub, like a car door. This option requires additional space in the bathroom and allows the most room to maneuver inside the tub. 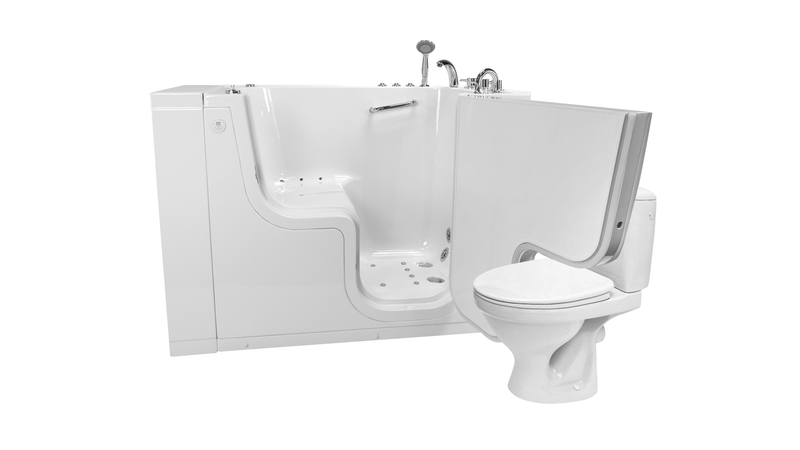 Our Ella exclusive two seat walk-in tubs offer the ability for two people to bathe simultaneously while seated comfortably. Our wheelchair accessible walk-in tubs have a large outward swing L-shaped door that is designed to make it easy for someone in a wheelchair to slide into the seat of the walk in tub. Ella’s Bubbles is a Chicago-based manufacturer of acrylic walk-in tubs and a nationally distributed manufacturer of private label accessible shower stalls and gel coat walk-in tubs. Our focus has always been on acrylic walk-in tub development, production, and distribution. Considering that acrylic is the better material option. It is important to understand the benefits of acrylic tubs over gel coat tubs. Acrylic tubs are formed from a solid sheet of material providing you with a consistent and quality product every time. They have a brilliant nonporous finish that is impermeable to mold and mildew, long lasting, and easy to maintain. Acrylics non-porous surface ensures that mold and mildew cannot seep into the material and build up over time causing several issues. Whereas get coat tubs are created using several layers of gel coat which causes a rougher porous surface that is susceptible to mold and mildew. Gelcoat walk-in tubs consist of a gelcoat layer sprayed on a mold and a layer of fiberglass over that to reinforce it. Then it is backed with wood and more fiberglass for extra versatility and durability. Gelcoat is a porous material, however it is very important to understand that the quality of the gelcoat walk in baths depends on craftsmanship, experience, and the quality of materials used. Be cautious about cheaper gelcoat walk in bathtubs available on the market as they may not have plenty of layers of gelcoat sprayed on and polished to perfection to achieve the long lasting, easy to clean surface. Gelcoat does have more versatile options and sizes that cannot be achieved with acrylic because of the nature of the material and the process of making it. Ella acrylic walk-in tubs are constructed of the highest quality grade white acrylic, with an easy to clean gloss finish that is reinforced with fiberglass. The acrylic shell is supported by a rust proof stainless steel frame for durability and adjustable leveling legs for easier installation. Outward swing doors benefit those who need a little extra room to enter the walk-in bathtub or those who have mobility issues and can’t maneuver around an inward swinging walk in bathtub door. Outward swing walk in bathtubs are also the best option if you’re looking for wheelchair access or a transfer walk in bathtub, considering that wheelchair accessible walk in bathtub seat height will align with the wheelchair. Our Ella brand outward swing door walk in bathtubs have 3 latches to prevent the door from warping. 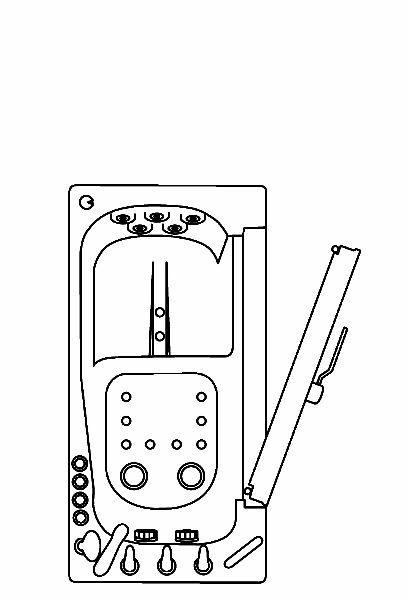 The 3 latch system increases the strength against water pressure to prevent any leakage. 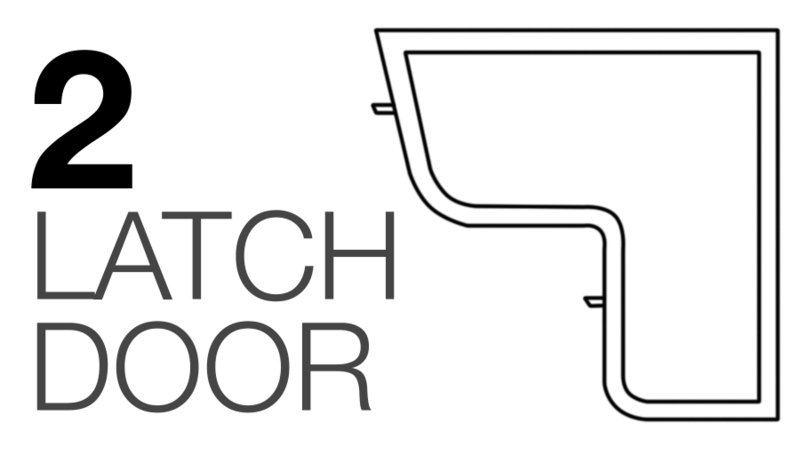 Inward swing doors are great for the common bather who doesn’t need the extra room to get into the walk in bathtub. They also are great space savers and perform well in smaller bathrooms as some bathrooms don’t offer the space needed to accommodate an outward swinging door walk in bathtub. They also are self-sealing. As the water pressure pushes on the door it further seals it to prevent leaks. 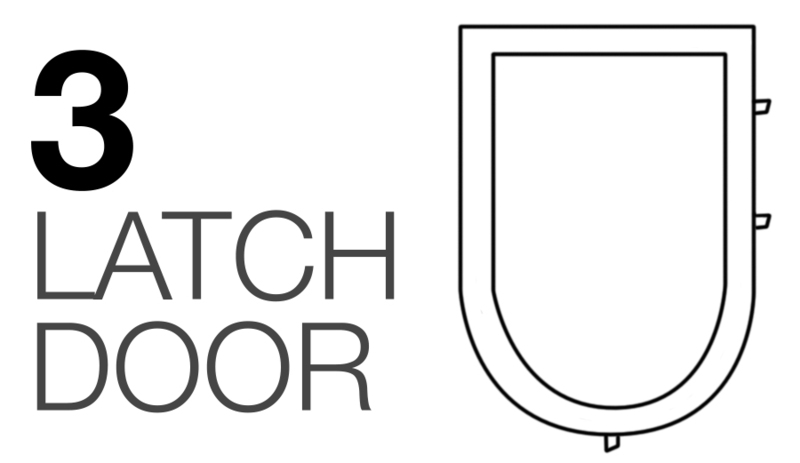 Picking the correct door type is an important detail that you don’t want to overlook. There are ‘U’ shaped doors that sport a modern design and are perfect for the common bather. L shaped doors are great for those with mobility issues as they allow for easy transfer from wheelchair to walk in bathtub and back. Another big decision you’ll have to make is the size of your walk in bathtub. We offer a variety of sizes to tailor to your specific needs. When picking a size you’ll need to take into account your body type, the water usage of that walk in bathtub, and whether or not you can fit it through your house and into your bathroom. Ella’s Bubbles takes into account that our customers come in all shapes and sizes. That’s why we offer walk-in tubs in multiple different sizes to accommodate every body type. The house drain positioning will determine where the walk-in tub can be placed. If it is new construction, the positioning of the drain and walk-in tub placement can be planned. In many remodeling cases it may not be feasible to change the drain positioning. Selection of the walk-in tub drain side will be based on drain positioning of the current shower or the bathtub. Your contractor must make sure the house drain can be connected to the drain of your selected walk-in tub. For example in many cases you have to choose the left drain/door walk-in tub to connect to the existing right side drain of the bath-tub or shower you are replacing. Please consult to your licensed contractor to assure the correct selection. It is important to be aware of the Ella end access panels. Ella walk-in tubs include one reversible end panel which can be installed to the other side. The additional end panel can be ordered in case if your tub is installed to the back wall as free standing. Please go to Accessory page for more accessory options like seat raisers, grab bars or head support. Another important aspect of size is whether or not the walk in bathtub will fit in your house or bathroom. If the walk-in tub is too large the walls may need to be cut to get the walk-in bathtub to your bathroom. This can be another costly expense so it is vital to pay attention to the walk in bathtub dimensions as well as your own bathroom and hallway dimensions. After you pick the size, the side of the door and the drain of your walk-in tub you can proceed with package selection. To make your process easier we suggest to follow these directions or call our customer service at 800-480-6850. It is important to understand that the fixtures and pumps (parts) for each massage or therapeutic option requires substantial space. These parts are normally installed below the seat on your walk-in tub. The bigger the tub is the more parts can be fit below so that determines what package can be installed on your tub. For example our Big4Two can have as many massage or therapeutic options as you wish since this tub is 36×80 and has 2 seats with plenty of space for parts to fit below. Selecting the packages is confusing to non professionals so it is important to revise the jetting options/packages we offer for each tub. Please note that we can add the whirlpool massage or therapeutic option to your tub even if there is not space below. This can be done on case by case bases and only if there is a closet next to your tub, and enough space in your closet to place these additional parts. Your contractor or Ella authorized reseller must revise each case and determine if that can be done. There are multiple whirlpool and air combinations of massage or therapeutic options available in Ella walk-in baths: air + hydro = dual massage, air + microbubble, hydro + microbubble, air + hydro + microbubble. Please view the diagrams of these packages. For example on some models the dual massage package also includes ozone, LED light, aroma therapy and more. 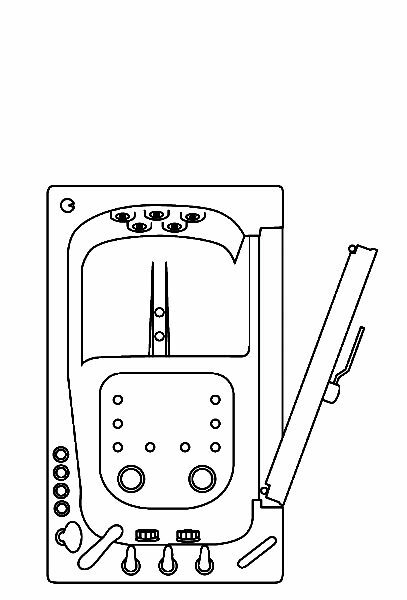 The package options with model numbers are shown in both walk-in tub category pages. Ella offers 3 faucet options or no faucet option on selected models. You can also choose the heated seat and backrest or dual heated seats for two seat walk-in tubs. Please feel free to ask your reseller or call us direct at 800-480-6850 so we can help you to make the right decision. Please view the Package and Feature diagrams. The space for parts placement below the seat of each walk-in tub will determine how many massage or therapeutic options can be installed/added in each tub. The custom jetting can be added on case by case bases. Now that you’ve picked out the most important qualities of your walk in bathtub all you have to do is pick out which features you would want. Our walk-in tubs come with a variety of options for added features and it can be a daunting task to figure out which ones you want. So we’ve compiled a breakdown of them for you to make the selection process that much simpler. With our Dual Drain Technology, Ella standard size walk-in tubs have an approximate drainage time of 80 seconds under ideal home plumbing conditions. Please make sure to check with your contractor as to what the best option would be depending on your in-home plumbing situation before an installation takes place. It is strongly advised that the house drains are tested prior to any installation to assure your drains are not clogged and to avoid drainage issues down the road. Ella Dual Drain Technology ensures that your walk-in tub will drain quickly, providing you with a fast and reliable exit out of your walk-in tub. Two independently operated stainless steel chrome finished 2” gravity driven drains, each equipped with an overflow and stainless steel chrome finish opener with an extended handle for an easy grip, work to drain your walk-in tub quickly and reliably. When the openers are turned, stainless steel cables connected to levers which the drains rest on open and close. 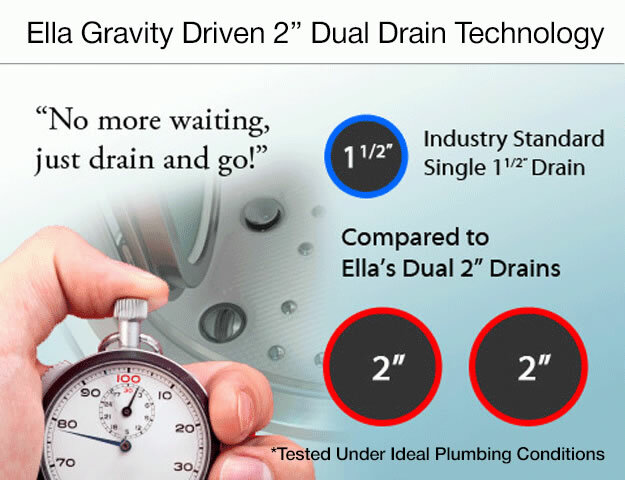 Having two gravity driven 2” drains not only provides you with quick and reliable drainage, but also acts as a safety feature incase one drain fails or becomes clogged, allowing you to still safely drain and exit the walk-in tub. The drains can be connected using a PVC Tee or PCV Y connecter to the standard 1 ½” or 2” house drain. We recommend using 2” PVC to connect the drains for a quicker drainage time. Gravity driven drains are some of the most reliable on the market; requiring no electricity to operate. Whereas electrical driven drains may fail due to electrical shorts or power outages. Along with comfort, walk-in tubs are designed to reduce the amount of injuries that occur in the bathroom. That’s why many of our walk in bathtubs come with features such as grab bars, slip resistant floors, low thresholds, and thermostatic control valves. Grab bars are strategically placed where support is needed most. Depending on the design of the walk in bathtub, some have deck mounted grab bars and others have them mounted to the inside bathtub wall. Check out our comparison charts pages located on each product listing page to determine how many grab bars your preferred walk-in tub comes with. All of our walk in bathtubs have a textured slip resistant floor. This helps to prevent slips and falls when entering and exiting the walk-in tub. All of our walk in bathtubs vary in threshold height but most are lower than your average bathtub. This makes it easier to step into the walk in bathtub without falling, especially for those with mobility issues that have difficulty stepping over higher ledges. 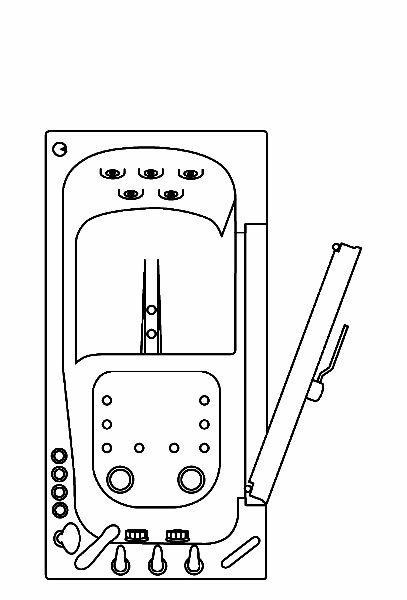 Our Low Threshold Model has our lowest threshold step clocking in at only 3.5’’. Then there is the Thermostatic Control Valve that is exclusive only to the Ella Acrylic Inward Swing Door Walk in Bathtubs and the Ella Acrylic Outward Swing Door Walk In Bathtubs. The Thermostatic Control Valve (TCV) is a valve that regulates and mixes the intake of warm and cool water to create the perfect water temperature in your walk in bathtub. The TCV is a great tool for preventing the water from reaching unsafe, scalding temperatures. The default temperature it is set at is 100.4° but it can be adjusted to your preferred temperature. At Ella, safety and comfort are at the forefront of our minds and that’s why our walk in bathtubs cater to minimizing bathtub related injuries. There are many features that we offer that can enhance your bathing experience but aren’t essential to your walk in bath. One such feature is the Heated Seat & Back Rest. Feel your muscle tension melt away as your heated seat warms you up to increase your relaxation. Two other features that can sometimes go hand in hand are Chromatherapy and Aromatherapy (Note that some Ella Acrylic Walk In Bathtubs don’t offer aromatherapy at this time). Chromatherapy is the addition of an LED light that cycles through the spectrum of color. Color adds a new dimension to your bath that can create a more calming atmosphere. Aromatherapy is the addition of scented oils that fill your bathroom with wonderful aromas that can whisk you away to a serene state of mind. Another optional feature you can include is Ozone Sterilization. Ozone Sterilization is a process that clears out all the water and air hoses and tubes to prevent mold or mildew from growing in them. 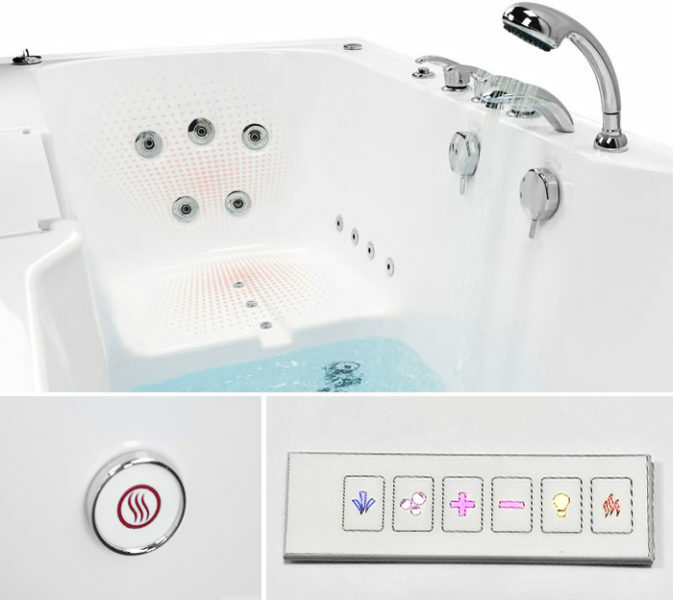 It’s activated with a simple press of a button and can be run during your bath. We care about giving you the best bath experience you can get and these optional features will help to reach that goal. Ella walk-in tubs can be equipped with upgraded fast fill faucets from Huntington Brass or Jandon. For a modern aesthetic Huntington Brass would be the way to go. However, if retro is what you are looking for, Jandon is the perfect option. Both offer fast fill times and are sure to fill your walk-in tub in no time. Huntington Brass faucets offer a contemporary look in a 5-piece or 2-piece option. When fill times matter our Huntington Brass faucets are sure to get the job done. The 5-piece modern faucet set comes in a chrome finish and includes a jewel arched solid brass spout, hot and cold valves, diverter, and a retractable handheld shower head (w/5ft flexible hose). Three-quarter inch supply lines (not included) provide up to an 18 gallon per minute flow rate from the spout, this can vary based on in-home plumbing conditions. The 2-piece Huntington Brass modern faucet set in a chrome finish offers the same 18 gallon per minute fill time while taking up less deck space on your walk-in tub. This option includes a spout with an attached faucet handle and diverter, as well as a retractable handheld shower head (w/5ft flexible hose). Both of these modern faucets are excellent options when it comes to fast fill faucets. If a retro faucet is more your style, then our 5-piece retro faucet in a chrome finish from Jandon is an excellent option. With a fill time of 16 gallons per minute your walk-in tub is sure to fill quickly. This 5-piece faucet set includes the spout, hot and cold valves, diverter, and a retractable handheld shower head (w/5ft flexible hose). The plumbing code requires you to have a thermostatic control valve in commercial applications like nursing homes, hospitals or for customer’s with safety concerns. Ella standard 5 piece faucet set that comes with a deck mounted thermostatic control valve, which is an anti-scald feature that keeps the water at a consistent temperature and prevents water from suddenly shifting to unsafe temperature levels. The purpose of a Thermostatic Control Valve (TCV) is to regulate the temperature of water before it reaches your sink or bathtub faucet. 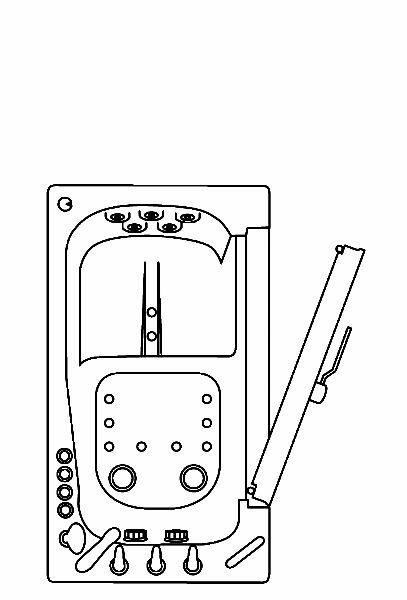 A TCV ensures constant temperature of water by blending hot water with cold water to prevent scalding or thermal shock. There are circumstances where inlet temperature and pressure are inconsistent and pose potential danger to a bather. Responding to these variations in temperature and pressure is the only way to ensure maximum bather safety. Read more about thermostatic control valve. The other specialty walk in bathtub we have is the Infusion™ Therapy MicroBubble Walk In Bathtub. The MicroBubble Jet is available on the Elite, Petite, and Royal models. The MicroBubble jet is different from both the air and hydro jets as it produces billions of tiny oxygen rich bubbles, much more and much tinier than the air jet can produce. These tiny bubbles go a long way into warming, moisturizing, and exfoliating you skin. MicroBubble jets will make your bath feel silky smooth and the effects will last long after you’re finished. There are some features that only our brand, Ella Acrylic Walk-In Tubs, can offer. These include the Removable Stainless Steel Door with Tempered Glass, the Patented 360° Swivel Tray, the Thermostatic Control Valve, and Dual Drain Technology. The Thermostatic Control Valve we discussed above in safety features. The Removable Stainless Steel Door with Tempered Glass is a sleek, modern door that can be detached from the walk-in bathtub. This allows you to be able to clean hard to reach places much more easily. The Patented 360° Swivel Tray is a tray that can easily be rotated so as to not make it difficult to enter of exit the walk in bathtub. It can hold your bathroom essentials such as a nice glass of wine or a good book and it doesn’t get in your way thanks to the rotating capabilities. The 360° Swivel Tray is available on the Elite, Petite, Royal, and Ultimate models. The Dual Drain Technology is a feature that helps to decrease drain time. With the addition of a second drain (no electrical equipment necessary) drain time can be reduced to 80 seconds in ideal plumbing conditions. This is important as the bather has to wait for the walk in bathtub to drain before being able to exit. Ella Brand Walk In Bathtubs stand out from the competition because we add such unique features. The 360° swivel tray is a patented product. This means you won’t be able to find the convenience of a swivel tray anywhere else! Other companies might try to recreate the capabilities that the tray offers, but their products won’t be able to offer the ease and comfort of the swivel tray. Their solutions can often get in the way and make the bath an uncomfortable or inconvenient experience. Alternatively, the swivel tray has the patented capabilities that allows the bather to rotate the tray out of the way to enter or exit the bath tub easily. It also provides a convenient, dry surface to place one’s belongings on. It even comes with a cap that can cover the screw when the tray is not in use for a more aesthetically pleasing look. Read more about Patented 360° Swivel Tray. The brand new four-fold shower screen door just launched by Ella’s Bubbles is the most convenient alternative to regular shower curtains. It is specifically designed and sized to fit on walk-in bathtubs in tight alcove openings or corner installs. This Euro-style semi-frameless 4-fold shower screen gives an airy open feeling with the option to push the screen aside quickly and easily. The sturdy construction of 1/8” thick lightweight glass secured in anodized aluminum frames enables smooth door operation with equipped high quality geared hinges strong enough to endure rigorous daily use. Read more about four-fold shower screen door. Increase you comfort with the Ella Walk In Bathtub Headrest. The headrest can be mounted on the wall or on the deck. The included suction cups makes for fast placement so you can enjoy your bath even more without having to constantly adjust your headrest. Read more about Ella Walk In Bathtub Headrest. Some of our walk-in tubs allow for extra accessories. One such accessory is the Seat Pillow Riser or the Bidet Seat Pillow Riser. These seat pillows add extra cushion and support to the walk in bathtub seat to aid in your comfort. Another accessory you can add is the Headrest. The headrest adds extra cushion and support just like the seat pillows, but it can be wall mounted with suction cups so you won’t have to constantly adjust it. If you need extra support you can add the Fold Down Grab Bar. The Fold Down Grab Bar can also be wall mounted and helps to increase your stability just like the other grab bars. Lastly, certain walk in bathtubs have the option of switching out certain faucets. We offer three types of faucet sets. There’s the Ella Original Brand Faucet that comes with a Thermostatic Control Valve, there’s the Huntington Brass Roman Faucet which comes with a fast fill faucet, and then there’s the Jandon Traditional Roman Tub Faucet which also comes with a fast fill faucet and offers a more traditional aesthetic. Adding accessories are just another way to create a rejuvenating bath.